I know that a bunch of you out there have been waiting all week long for Friday to finally arrive. And not just any Friday, but the start of a long holiday weekend, too. Meh, from me. As the Hubby Dearest works Friday, (including night call) Saturday, and Sunday, I actually forgot about the official holiday on Monday! I was trying to set an appointment and had said that either Monday or Tuesday would work, when the other person said….”well, Monday’s a holiday”. Well blow me down! I laughed and said, I don’t think your wife remembered that either, because I already have an appointment with her that day. 🙂 Rest assured that has now been re-scheduled, so that the two of them can have some time together. What about you? Who has big Labor Day weekend plans? While we’re here, I’m going to do an FO Friday report, too. 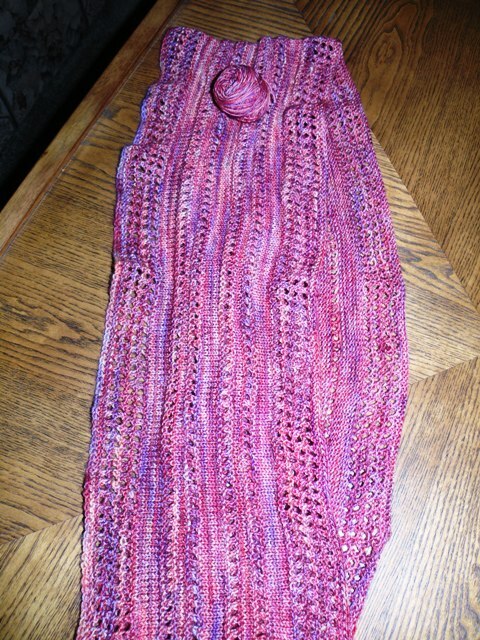 Back on July 4th I finished my version of Irishgirlieknits Summer Wind cowl. I was doing a KAL with the group on Ravelry. I forgot to post it back when I posted the baby blankie. Oops. I DID say I have no brain any more, right? Yarn is Malabrigo sock, in the Archangel colorway. LOVE both the pattern and yarn. Soft and yummy. I called my version Sunset Breeze because the colors made me think of….a sunset! 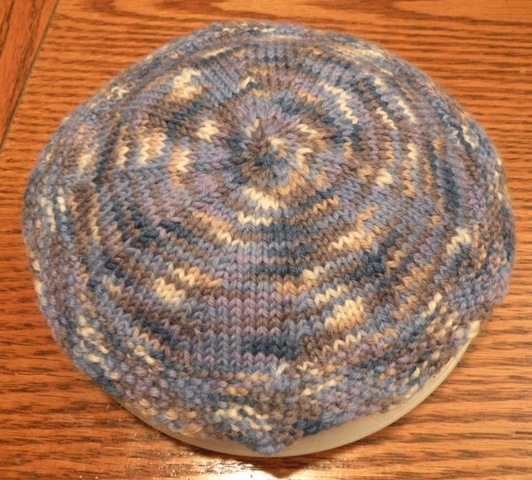 A little earlier this month I whipped up two Kippah for Daniel to take to Israel with him. Both are made of sock yarn. The one is from a gift from Holly and the other I bought, but immediately lost the ball band for it, so it remains a mystery. Quick, easy knits. Gotta love that. And last, but not too least, I made a pair of Cottage City Mitts for the Teatime On The Moors KAL for the Jane Eyre group on Ravelry. I bought the yarn at Stitches back in February from one of the Bargain Bins. No label. But I am sure that it is Cascade yarn, and think it is Sierra. Very, very pink! 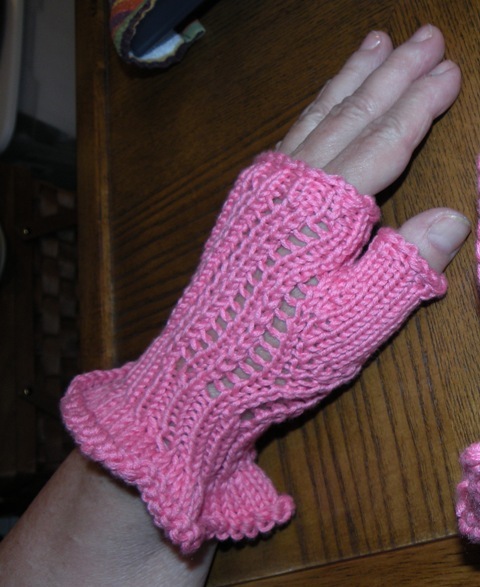 These are light and lacy, and suit the mostly cotton yarn very well; which means….they’re for looks not for keeping your hands warm! I finished these while we were on the coast over the weekend, and since I didn’t want to bring my next blankie with me, I started a dishrag after that…not too exciting, I know, but it worked for having something to do while I sat watching the river flow by…. I’ll tell you all about the new blankie….next time. 3) getting the new washer and dryer dropped off tomorrow. But posting the FO for Aug would be a really good idea! We are laying low for the holiday. Love all your finished products! Love the knits! Wishing him a wonderful trip. And safe, too. what great finished objects!!! I love the cowl!!! 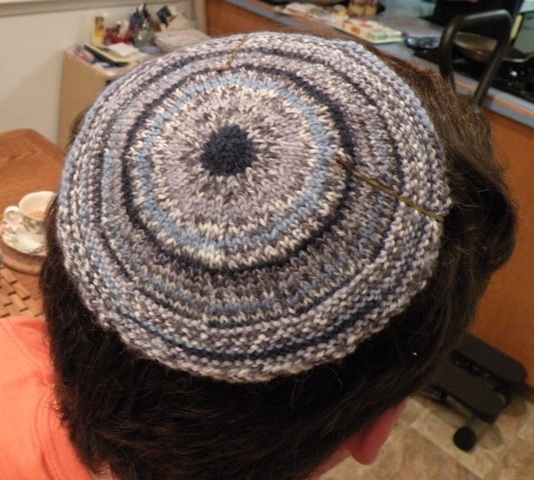 Nice Kippahs! I just hope the wool isn’t too warm for him at this time of year!